When writer Les Woodland told me he planned to see the Gent 6-Day race and asked me if I would like to join him, I thought that would be just plain crazy. Travel 6,000 miles to spend a week in a country so expensive money evaporates just to sit with hundreds of beer swilling Belgians watching grown men ride bicycles? Of course I would! I've always wanted to see a 6-Day and the Gent race is the granddaddy of them all. Can't tell the riders without a program! Here's the cover from the Gent 6-Day program. The Gent 6-day (called a zesdaagse in Flemish) has a long history, going back to 1922 when Oscar Egg and Marcel Buysse were the winners. 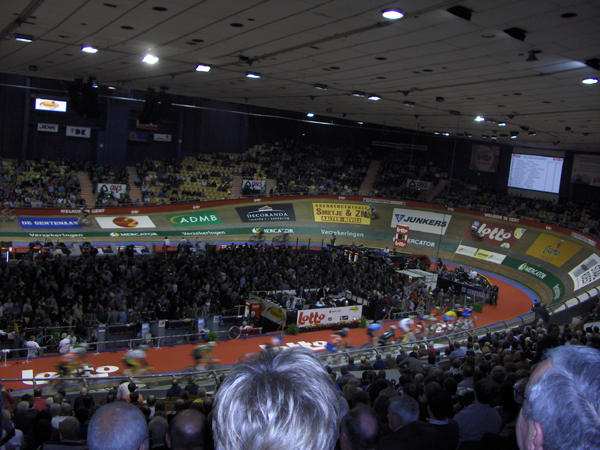 The days when indoor racing gave cycling fans a chance to see their road heroes is long gone. It used to be that men like Rik van Steenbergen, Fausto Coppi and Eddy Merckx would spend their winter months on the wooden tracks. It was a wonderful chance for enthusiasts to see the giants close up rather than standing by the side of the road and watching them whoosh by. Today roadmen make plenty of money and don't have to compromise their careful training schedules or take a chance getting injured in a crash on a track while chasing extra pay. Almost all of the riders who race the 6-Days are track specialists. I recognized only a few of the names were familiar to me. Winner Robert Bartko was a good road rider, winner of the 3-Days of West Flanders in 2004, and Leon van Bon was a superb roadman, but they are the exceptions and their good road days are behind them. 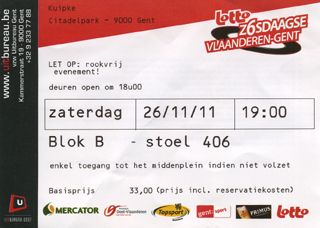 Our first evening was at the Gent 6-day's second night; Wednesday, November 22. I was totally unprepared for what hit me when I emerged in the stadium. The music and announcer's voice (almost always calling the race in Flemish, only occasionally in English) was deafening and many of the spectators have air horns. The track is small and steep. A lap is only 165 meters (current Olympic velodromes are 250 meters). 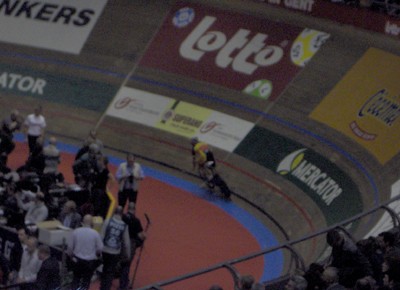 The velodrome's nickname, Het Kuipke, means tub, or hipbath, which should give an idea of the intimacy of the place. It all adds up to an assault on the senses that lets you know you are in a place that racing matters. Being that close to the action, the sense of speed is heightened. Even though the races had been going on for a while, the stands were still filling. 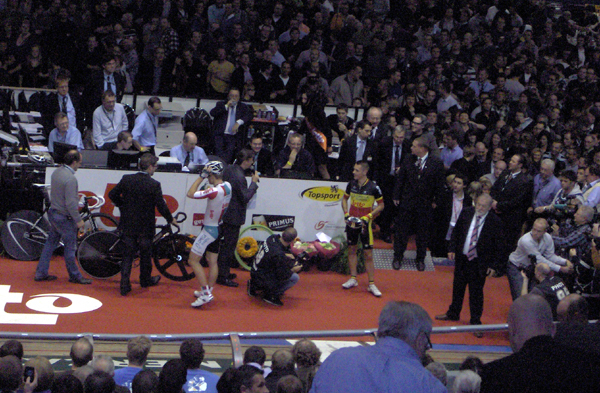 In this picture the riders are warming up while the announcer introduces the two-man teams. 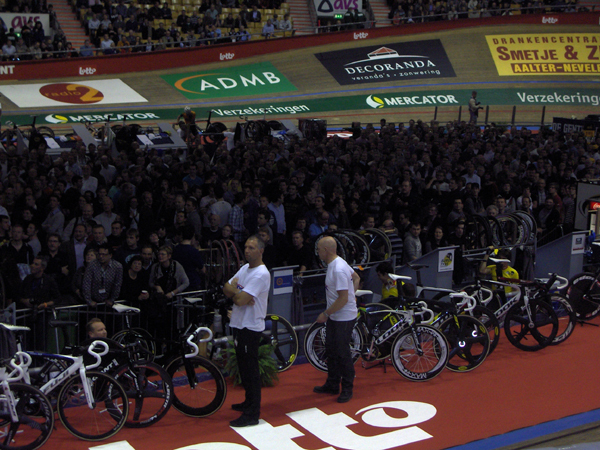 During the week of the 6-Day, Gent was full of British racing fans. One was more likely to hear English spoken in hotel lobbies than Flemish. 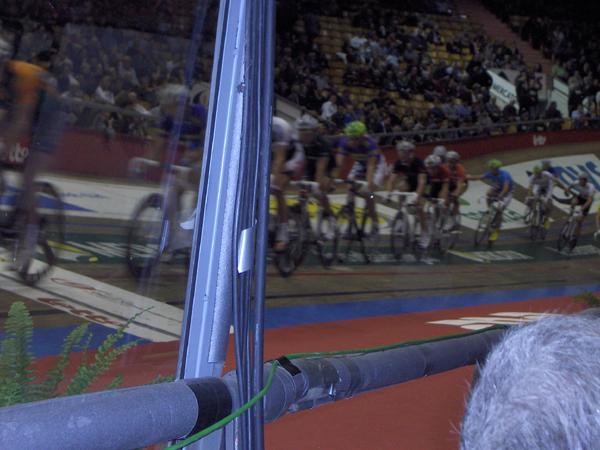 Being able to get next to the rail to feel the wind as the riders blast by almost made dealing with US Air worth it. Maybe years from now I'll forget US Air cancelled my return flight without even bothering to send me an email. Maybe, but probably not. 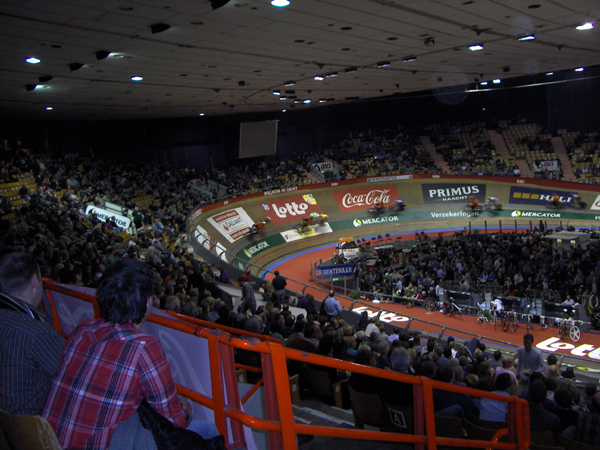 In the 2006 Gent Six-Day, rider Isaac Gálvez hit the railing and later died from his injuries. The mechanics, in white t-shirts, are kept busy as the riders come on and off the track for different events. Also, wheels get changed for different competitions. The infield, with the announcers, scorekeepers and officials, was always packed with spectators. I don't think you can really follow the racing while watching from the infield, but everyone down there is full of beer, enjoying the spectacle and having a great time. A conga line broke out one time. Anyone can move from his seat to the infield. Even though for me, an intelligent understanding of the racing is difficult while in the crowded pit (I know, the officials seem to do just fine there), the view is intoxicating. 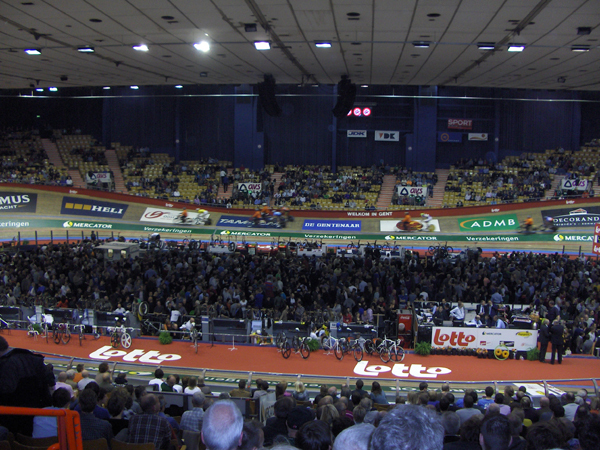 In this picture the madison race is in full swing. You can see two handoffs, especially the white riders in the back. Sorry that the autofocus was more interested in the railing. Each evening, the program is largely the same about 12 different races, including a madison, flying 166-meter time trial, derny races, scratch race and a miss and out. The pros start after 8:00 PM and race until one in the morning. I never made it to the end. The current track was built in 1965 after a 1962 fire destroyed the one installed in 1927. On Saturday, the next to the last day, we got a treat, a 3,000 meter pursuit match between Philippe Gilbert (in Belgian Champion's kit) and his Lotto teammate Jurgen Roelandts. In magazine race photos Gilbert always looks like a big, muscular man. But I keep forgetting how small most of the the top pros really are and Gilbert is no exception. Gent 6-day race director (and immortal cycling great who won 88 6-Days, still the record) Patrick Sercu can be seen over Gilbert's left shoulder in glasses with grey hair and dark tie. Being an incompetent photographer, this is the best picture I got of Gilbert. Gilbert and Roelandts were neck and neck for the first 2,500 meters. Then, to no great astonishment, Gilbert pulled slightly ahead at the end. The crowd went absolutely nuts over Gilbert, they loved him. He is the real king of Belgium. 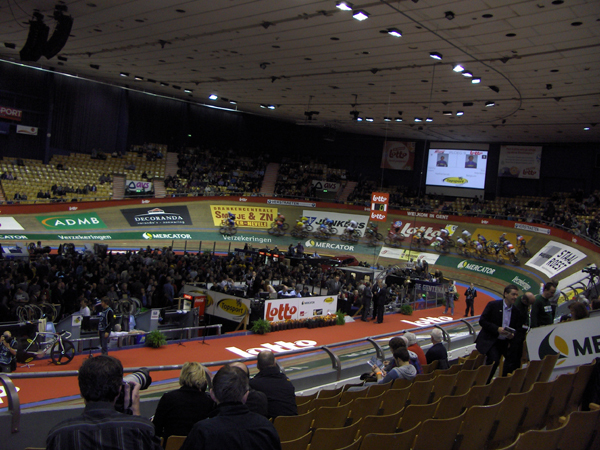 Is there a racing fan who hasn't dreamed of watching a motorpaced race in an indoor velodrome? In the 1920s the racing could be behind motorcycles with engines as big as 2,000cc, that a much bigger engine than my car has. Today they use dernys, with engines of about 100cc. They are built so that if the engine dies, the machine will not stop, a vital consideration with the riders zooming around at high speed. In the picture above, the pacers are wearing orange long-sleeve jerseys. The field is kept small, just six or so riders with their pacers at a time. It is a cool as it sounds. 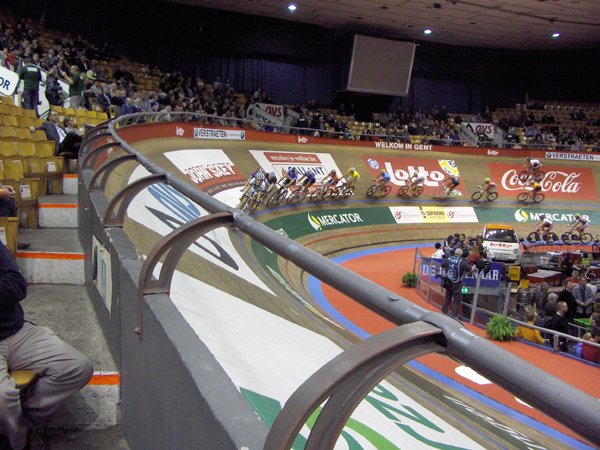 Put watching a motorpaced race on a small velodrome on your bucket list. Another shot of the derny racing from the cheap seats (a relative term given the strength of the Euro). I preferred watching the racing from higher up. All the seats at the Kuipke are good. Les Woodland sent me this picture of a Derny that isn't racing around a track. The ticket stub from Saturday's racing. It's an expensive hobby for an American who wants to see several days' racing. That evening cost 33 euros (about 42 US Dollars). It was well worth it. Really. Interested in the 6-Days of the 1920s? 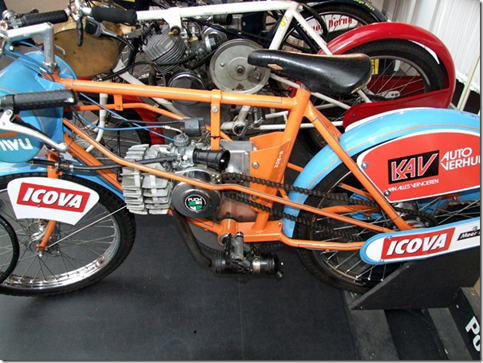 Here's a link to a photo gallery of track racing way back when. 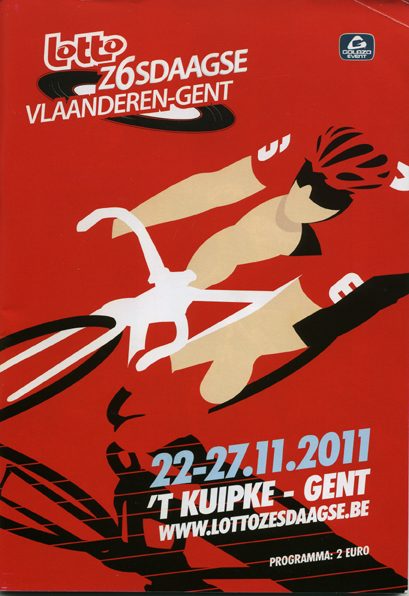 Oh, and the 2011 Gent 6-Day was won by the team of Robert Bartko and Kenny De Ketele.